Victor Espinoza rides California Chrome to victory in the Dubai World Cup sponsored by Emirates Airline as a part of the Dubai World Cup at Meydan Racecourse on March 26, 2016 in Dubai, United Arab Emirates. 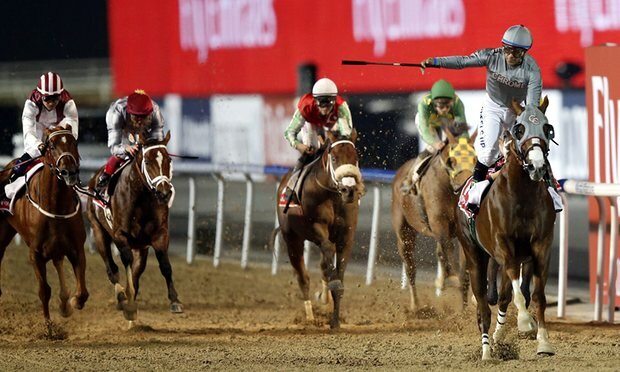 California Chrome proved emphatic winning the Dubai World Cup by five lengths on Saturday. The planet's richest horse race, saw art Sherman-trained Chrome win well in the hands of jockey Victor Espinoza, despite the saddle slipping. The five-year-old U.S. stallion accelerated clear in the 2,000-meter race on dirt. "These days, it proves how he can run when he is 100 percent. He felt effective all the way through the prep." Chrome, the heavy favourite for the 2nd straight year, began from a poor stall in eleven but was promptly in stride and, besides the fact that he ran wide the entire time, positioned himself next to Msawish, who took the early lead under Frankie Dettori. "He likes to be on the outside," Sherman said. "I just instructed Victor to get him ready to win. "It's the dream of a lifetime for me, it does not get better. The Chromies (lovers) should be going crazy." The Mike de Kock-trained Mubtaahij finsihed 2nd, followed by Hopportunity of the U.S.
California Chrome was named 2014 American horse of the year for winning the Kentucky Derby and Preakness Stakes, however did not race for 10 months remaining because of a bruised bone. He started his comeback at Santa Anita in January, when he arrived at the Emirates to acclimatize. This being his third straight win, worth $10 million. Sherman said Chrome would be heading home, unlike last year when he taken to England. "I don't believe he'll go to England," he said. "We'll give him 30 days at the farm to let him unwind, and the ideal race is the Breeders' Cup (in November at Santa Anita)."